At the risk of being so last year (or even so last year's last year) it's another cupcake recipe from me. I would like to think of this cupcake as "retro" instead of passé. Nevertheless, I present to you my deep dark chocolate espresso cupcake. I know it bears a slight resemblance to those brand name cupcakes that you can buy at the supermarket or convenience store and probably ate as a child. But appearance is where the similarity ends. My cupcake is a dark chocolate cupcake filled with a creamy espresso mascarpone cheese, chocolate glazed and decorated with a squiggle of icing. 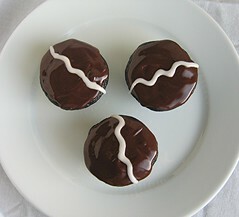 Although I couldn't really taste the coffee in the cupcake, it adds some depth of flavor when paired with chocolate. The filling is all about espresso. Creamy mascarpone cheese is transformed with ground espresso beans making this a grown-up version of a childhood favorite. Preheat oven to 350F. Line 30 standard (4 fl oz capacity) muffin cups with paper liners. In the bowl of a stand mixer, sift together flour, cocoa, sugar, baking soda, baking powder, and salt. Add the eggs, egg yolk, milk, oil, vanilla and coffee and beat on low speed until well combined. Fill your prepared muffin cups about 2/3 full. Bake until a cake tested comes out clean, about 18-23 minutes. Leave cupcakes in pan for 5 minutes then remove from pan and cool completely on cooling rack. In the bowl of a stand mixer, beat the mascarpone, milk, vanilla and espresso until fluffy. On low speed, slowly beat in the sugar until smooth. Transfer filling to a pastry bag fitted with a 1/4-inch plain tip. Insert tip into the top center of cooled cupcake and dispense about 2 tsp filling into the cupcake. Combine chocolate, butter and corn syrup in a small saucepan. Stir over low heat until well combined about 2-3 minute. Remove from heat and stir in vanilla extract. Frost the filled cupcakes with the warm glaze. Kitchen Wench Ellie told me about the cupcake round-up event hosted by Cupcake Bakeshop’s Cheryl and Vanilla Garlic’s Garrett. Fellow San Franciscan Cheryl blogs exclusively about her super creative, out-of-the-box cupcake masterpieces and Garrett does Sacramento proud with his culinary shibby-ness in the kitchen and about town. I’ve created quite a few fun cupcake combinations in the past few months (like my mojito cupcake and Boston cream pie cupcake), but I thought I would submit my chocolate espresso cupcake since it’s my most recent one. There’s nothing ground breaking as far as the flavors go but this one was all about taking a humble snack food and turning it into fancy food. And thanks to Sarah for making my cupcake Slashfoodpornalicious! Whew! Now that’s a whole lotta linky love. I have to admit I like those "other" cupcakes (nostalgia, you know?) but yours I'm SURE are much tastier. They're certainly as cute! Mary, those store bought cupcakes wouldn't stand competition - yours are so much better! 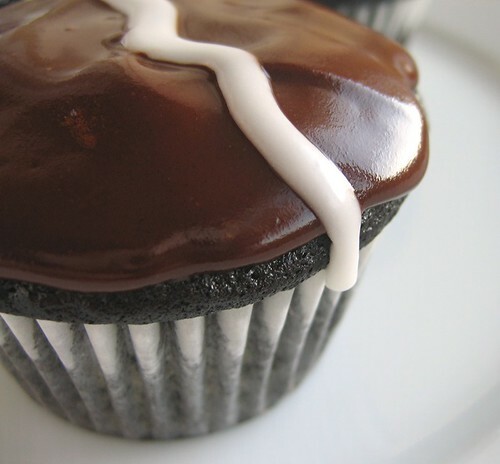 I saw your cupcake photo on Slashfood. It is a beautiful photo! I need to try your recipe! These are absolutely stunning - I've never seen black cupcakes before (brown ones, sure, but never black!!). I know what I'm making for the pool party this weekend! i tried your recipe this afternoon and it turned out to be so delicious. i have been looking for a dark cupcakes in which not too sweet and moist and finally found yours. thank you for sharing the recipe. They look like grown up Hostess cupcakes. Abby - Nostalgia always makes food taste better. Fer - I was pleasantly surprised that Sarah deemed my cupcake worthy of the Slashfoodporn. Ellie - I love how dark the cupcakes turned out. Syl - It's always nice to hear that my recipes work for other people too. Thanks for trying them. Peabody - Yup, but without the 7 loops of white icing. These look fantastic Mary. 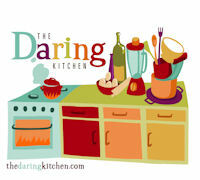 Thanks for stopping by and leaving a comment on my cake post! I was actually thinking the devils food recipe would make great "fauxtess" cupcakes! Oh yum, I'd love to bite into one of those right now! I can't imagine anything better than eating that cupcake with my coffee, which I'm drinking right now! They do remind me of the cupcakes that I bought in the grocery store as a child. But, yours leave them in the dust, of course! what a photo! perfect plating. please save me some of those! i don't think mine will turn out quite as nicely as yours have! Oh I thought this was so much fun - what a great post! my gosh it seemes so appatizing! i love chocolate & coffee. You have my 2 favorite things together, chocolate and espresso together... it's beautiful! How do we tell the difference b/w normal cocoa n dutch processed cocoa? i bought 2 boxes of cocoa Van Houten n Droste. Both are made in Holland. I know dutch processed cocoa has been treated with alkalizing agent but tht doesnt help me. Melissa- The best way is to look at the ingredients. Alkalized, also known as Dutch-process, will include "alkali" in the list of ingredients. Non-dutch processed cocoa will simply say cocoa. I hope this helps. Just made these after finding your recipe doing a Google search on "espresso cupcakes"--they were so incredibly good and I can't believe how yummy the center is. My only question is, I'm refrigerating them overnight (they're for a work party mid-day) because of the mascarpone cheese; did you do the same to keep them, or fill them immediately before serving or...? Just want to know, since I'll most certainly be making these again & want to serve them in the best way. Thanks! Kalila - I'm glad you liked the cupcakes. It's fine to refrigerate them. Although I would take them out at least 30 minutes before I plan to serve them. They're good cold, but better when at room temperature. I found, followed and fell in love with your recipe! Very easy recipe to follow. Great images of the final cakes they look like something you would see in a magazine. Chocolate and coffee is such a winning mix, not too sweet. I stumbled on yr site when I googled "How do I tell when cocoa is Dutch-Processed?" Thank you for your invaluable tip abt alkali in its ingredient list! I knew about the alkali process but didn't know how to tell without opening each tin to look at the colour of the cocoa. It is rather difficult to get good cocoa or chocolate in Singapore, Asia. Much harder to find something that is dutch-processed. Btw... I lurrrrrve the visual of your Choc.Espresso Cupcake. Mmmm... to me... Visuals is just as impt as Taste! You can bet I will be following your flog from now on! your cupcakes were a slice of heaven. i just wanted to mention that hersheys makes a special dark cocoa now. 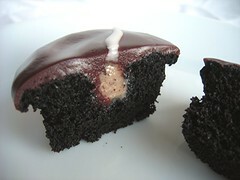 i tried it and was surprised with its rich flavor and black color on my cupcakes. WOW, they look fantastic!! I think I'll give them a go soon.